Graphic artist Kevin Martin created this graphic. One area of my job that I need to work on more is community engagement, specifically creating contests that excite people, engage them with our news sites and social media channels, and inspire them to invite their friends to join in the fun. And through a new reader rewards platform called Michigan Rewards that we recently launched, I have an opportunity to create contests that engage, and drive audience to print and online. I posted our first two contests Friday. My selfie with Michiganmade Jiffy Mix. 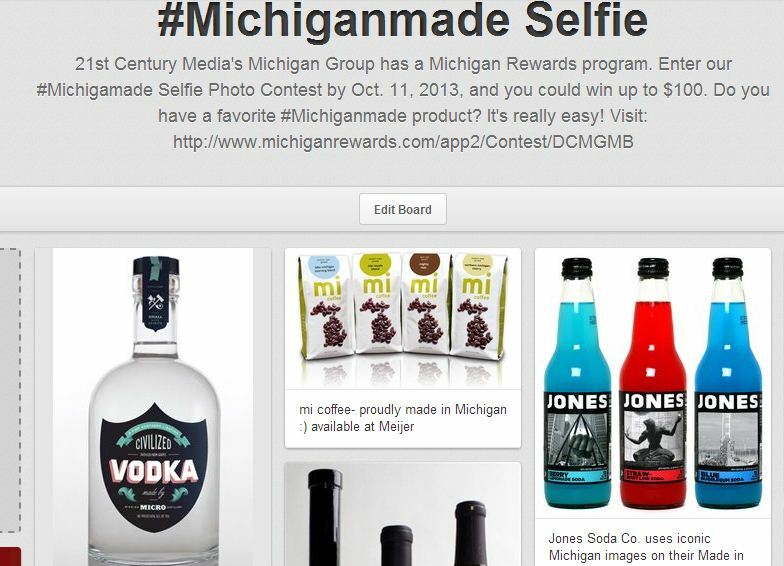 One is our #Michiganmade Selfie Photo Contest. It’s designed to encourage audience participation in our Made in Michigan coverage, a special section highlighting products made in Michigan. I’ve also created a RebelMouse page to complement the section, bringing in all #Michiganmade and #MadeInMichigan hashtags on Twitter, @PureMichigan tweets and Pure Michigan YouTube videos. I’ve had fun promoting the photo contest, creating my own selfie with a box of Jiffy Mix, Pinterest board, and promoting it on all of our Twitter and Facebook channels with a beautiful graphic created by The Macomb Daily’s Kevin Martin. This graphic was created in PicMonkey and shared on our social media channels. The other contest is just in time for Halloween. 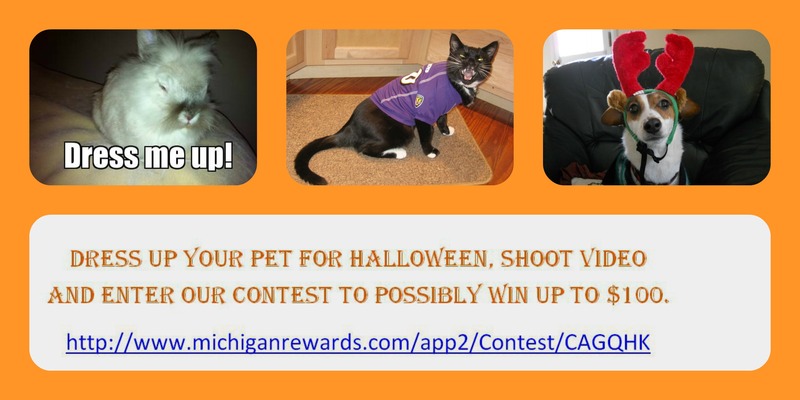 We’re encouraging you to dress up your pets in Halloween costumes and shoot a video, upload it to MichiganRewards.com, and ask family and friends to vote. I’ve promoted it with a meme, a collage that I created in PicMonkey and a gif, my second ever. 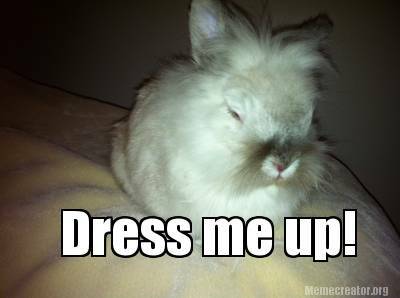 My bunny Ari stars in the meme I created to promote the video contest. I’ve also created Touts promoting both contests. In the Tout below that I embedded from Twitter, I humiliated my cat, Samson, by dressing him up as a sports reporter with a baseball cap, notebook and pencil. As you can imagine, he wasn’t too excited about it. We’re awarding $100 for first place, $75 for second and $50 for third. So far, we have four entries in the #Michiganmade Selfie Photo Contest and none yet in the Best Costume-Clad Pet Video Contest. I am excited to dip my toe in the engagement waters, so to speak, with these two contests and look forward to offering more. I’ve also set up a Word of the Day, featuring the name of a Michigan landmark in print and encouraging readers to enter the word(s) online at MichiganRewards to earn points toward prizes. Look for more to come as I get to know the true potential of this new platform. And please share your ideas with me.